1948 is the second full year of peace and prosperity after the world-wide conflagration that was the Second World War, and the crippling desperation of the Great Depression which preceded it. As hard as everyone worked to survive the austerity of the Depression and given the sacrifices made during the War, now that most of the boys are home there is little wonder that everyone began acting as though it was their duty to not only ensure that such an all-encompassing War can never happen again but to enjoy the blessings of prosperity to their fullest. One sign of change was the realization that Great Britain was no longer quite a great power. This was brought home by the Indian Independence Act of 1947. An important provision of the Act was the partition of British India into the Dominion of India and the Muslim-dominated Dominion of Pakistan. Although there had been continual strife between Hindus and Muslims, Partition was a solution which angered many. Indian spiritual and political leader Mohandas Gandhi was determined to make independence work, including acceptance of Partition, which led Nathuram Godse to shoot him in the chest during a prayer meeting on January 30. 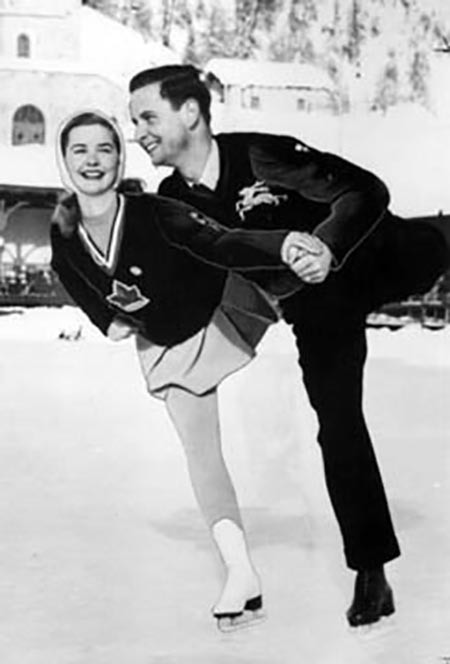 The 1948 Olympic Historical Recordings opened in St. Moritz, Switzerland, the first tie the games would be celebrated in twelve years. The site had been selected, in part, because of Swiss neutrality during the War, but politics still dominated the atmosphere of the Games. The USSR did not send athletes (although there was a group of Soviet observers on hand to determine how a Soviet team would have fared) and Germany and Japan were not invited because of their roles in the War. Post-War Recovery showed in the small crowds at most venues, and in one instance, skiers from the Norwegian team had to borrow skis from the Americans because they could not afford to bring their own. There were no new venues built for the Summer Games in London, which were celebrated beginning July 31, lending the nickname "The Austerity Games" to the event. The London Games also saw the first political defection in Olympic history when Marie Provazníková, President of the International Gymnastics Federation because a coup in February had brought Czechoslovakia into the Soviet Bloc. When the Allies occupied Germany after the War, the country was divided into different occupation zones, with each of the major powers administering its own sector. The capital, Berlin, was similarly divided, but the city was physically deep within the Soviet zone. Stalin had envisioned a united Germany under a Communist regime after the War to be a client state of the USSR.To further that course, all riverine, road, and rail access to Berlin from the West was cut off in June, leaving West Berlin with only a 36-day stockpile of food and 45 days' worth of coal. There were 1.5 million Soviet troops surrounding Berlin at the time while American and British forces had been drastically drawn down since VE Day. The Western Nations were unwilling to spark a Third World War but also unable to abandon Berlin. An airlift was quickly organized, forcing the Soviets to realize that the only way to stop a group of unarmed cargo planes was to shoot them down, casting them as the aggressors in WWIII. In short order, more than 646 tons of flour and wheat, 125 tons of cereal, 64 tons of fat, 109 tons of meat and fish, 180 tons of dehydrated potatoes, 180 tons of sugar, 11 tons of coffee, 19 tons of powdered milk, 5 tons of whole milk for children, 3 tons of fresh yeast for baking, 144 tons of dehydrated vegetables, 38 tons of salt and 10 tons of cheese was being loaded onto planes and flown into the city every day. After the First World War, Great Britain had been given a mandate over the lands of Palestine. The government approved the idea of establishing a homeland for the Jewish people in the area but was reluctant to abuse the rights of the Palestinian Arabs living there. After WWII, there was increasing violence in the region between Jews and Arabs, so Britain handed the matter over to the newly formed United Nations. In November 1947, UN Resolution 181 (II) was passed, partitioning Palestine into Jewish and Arab sections, based roughly on the population majority in each area, but made no provision for a new state. On May 14, a provisional Jewish government took matters into their own hands when David Ben-Gurion proclaimed the Declaration of the Establishment of the State of Israel. The states surrounding the newly formed nation responded by invading with the intent of driving Israel into the sea, but they had not counted on the ferocity of the Israeli Defense forces. 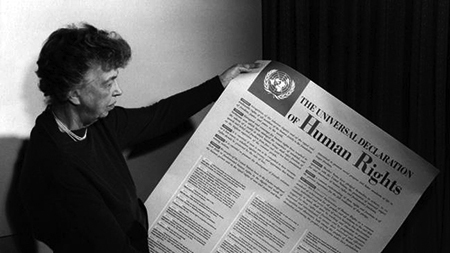 On December 20, the United Nations General Assembly formally adopts the Universal Declaration of Human Rights. Reflecting the common human experience of two World Wars, the Declaration reflects the spirit of Franklin Delano Roosevelt's "Four Freedoms"; Freedom of Speech, Freedom of Religion, Freedom from Fear, and Freedom from Want. One of the nails in the coffin of the British Empire was the Indian Independence Act of 1947. A major provision of the Act was the partition of British India into Muslim dominated Pakistan and Hindu India. Partitioning was far from universally accepted by the Indian people, and religious riots broke out around the country. Calling for his countrymen to observe peace, Mohandas Gandhi began a "fast unto death" to help quell the violence on January 12. Hindu Nationalists felt Gandhi was too accommodating, and on January 30, assassin Nathuram Godse fired three pistol shots into Gandhi's chest, killing the prophet of nonviolence. 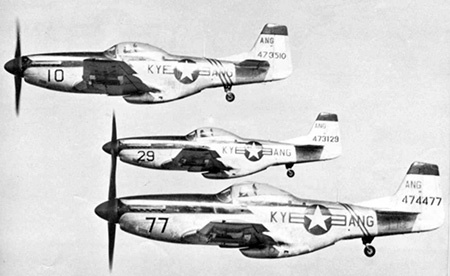 Captain Thomas Mantell, an experienced and decorated pilot with the Kentucky Air National Guard, blacked out while flying his F-51 Mustang in pursuit of an Unidentified Flying Object, and died when the plane crashed into a farm near the Kentucky-Tennessee border. There had been earlier reports of UFO, but until Mantell's death they had been relegated to "silly news" reports. After the Mantell Incident, UFOs began to be taken seriously. The Winter Olympic Games open in St. Moritz, Switzerland, on January 39. The Summer Games will open in London on July 29. The Games have not been celebrated for 12 years because of WWII, the last Olympics were the 1936 Berlin Games. The London Games will be know as "the Austerity Games" because Britain, desperate to recover economically from the War, cannot afford to build any new venues for the events. 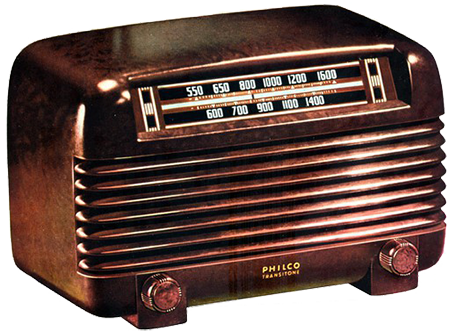 The Soviet Union begins taking measures to jam broadcasts of The Voice of America radio program beamed into the country on February 1. 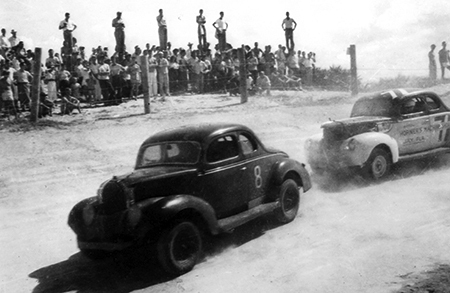 Mechanic Bill France Sr. organizes a group of race car drivers in Daytona Beach, Florida, on February 21 to form the National Association of Stock Car Auto Racing, NASCAR will become the second most watched professional sport after NFL Football. A group of restless WWII veterans come together in California n March 17 to form the Hell's Angels Motorcycle Gang. Renowned Italian conductor Arturo Tuscanini debuts on television with the NBC Symphony Orchestra on March 20. Baseball legend Babe Ruth dies quietly in his sleep on August 16. Laurence Olivier's Hamlet makes its American debut on September 29. The House UnAmerican Activities Committee subpoenas former Communist Party member and Soviet spy Whittaker Chambers on August 5 and begins a tradition of "naming names" before the HUAC. Among the Communists whom Chambers claims have worked with and for him is State Department and United Nations official Alger Hiss. 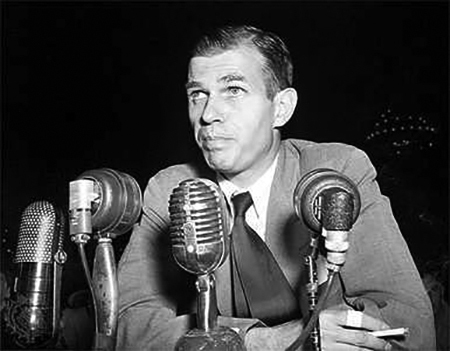 Hiss appears before HUAC to deny the allegations, but he is eventually convicted of perjury before Congress. Ironically, Chambers was guilty of many of the same crimes he accused Hiss of and more, but he was protected because of his cooperation with the Committee. The Korean Peninsula south of the 38th Parallel is established as the Republic of Korea on August 15. The People's Republic of Korea is established on September 9 under the leadership of Kim il-Sung.The last Soviet troops will withdraw from the North on December 26. The first Porsche 356 sports cars roll off the line. 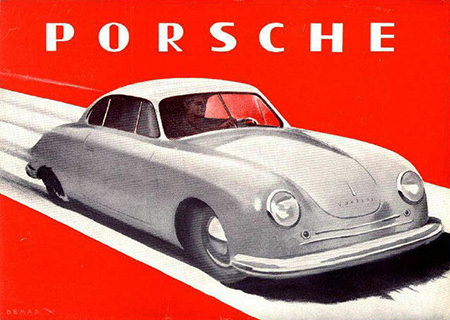 The 356 is designed by Ferry Porsche, son of the designer who introduced "the People's Car" to Adolph Hitler, and the 356 and succeeding Porsches have many similarities to the VW Beetle. The iconic Land Rover is introduced at the Amsterdam Autoshow in April. The Land Rover used technology developed for the American Jeep in WWII, but although popular with the military and adventurers, the Land Rover was designed to act as transport and a tractor for farmers, early models included a power-take-off to power fame machinery. Willies-Overland introduces the Jeepster, a sportier version of the utilitarian Jeep, making it one of the earliest SUV "crossover" vehicles. At the end of WWII, the victorious Allies divided Germany and its capital, Berlin, into specific zones of Occupation. Berlin was deep within the Soviet zone, and on June 24,the Soviets blocked road, rail, and waterborne access to the city in an attempt to drive the Western forces out. The response, beginning on June 25, began with Operation Vittles, the delivery of necessities to the city via Air Force Cargo planes. 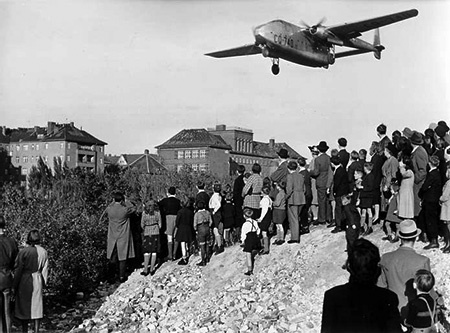 The overall effort became known as the Berlin Airlift. On July 20, President Truman reinstated the peacetime draft for only the second time (the first being under FDR in 1940). He also signed Executive Order 9981, which lifted racial segregation in the military. 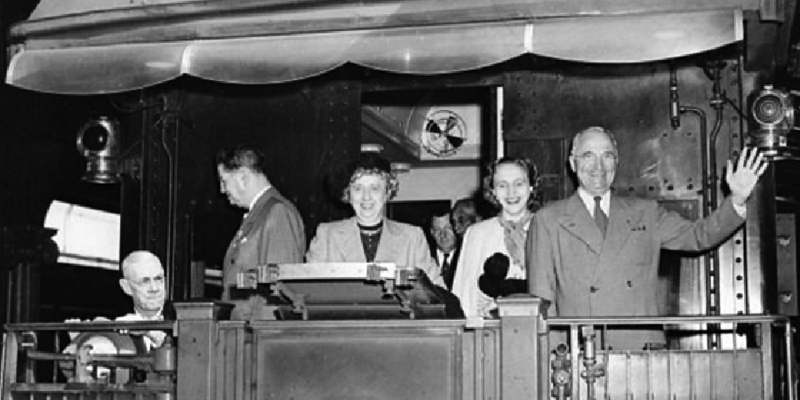 On November 2, Truman won reelection over "Dixiecrat" Thomas Dewey. CBS drops The American School of the Air, but introduces Life With Luigi and Cabin B-13. Box 13 is heard on Mutual, and NBC drops Fitch Bandwagon and Believe It Or Not. Be the first to comment on "1948"